Peter Ackroyd fans will be familiar with Dr John Dee, a 16th Century mystic who advised Elizabeth I on matters magical. Dee dabbled in all kinds of investigations, attempting to contact angels and demons, developing advanced algebra, pursuing alchemical dead-ends while also practicing both astrology and astronomy. He stood with one foot in the old, supernatural world and the other in the emerging culture of rationality and empiricism. You most definitely would have wanted him at your dinner party. Some of Dee's possessions can be viewed at the British Museum. You'll find them, curiously, in the Enlightenment Gallery, that huge and spectacular room along the east side that's lined with leather-bound volumes. At the front of the picture above, you can see Dee's crystal ball. We tried several times to take a close-up shot, but neither of our cameras could get a sharp fix. It is obviously haunted. 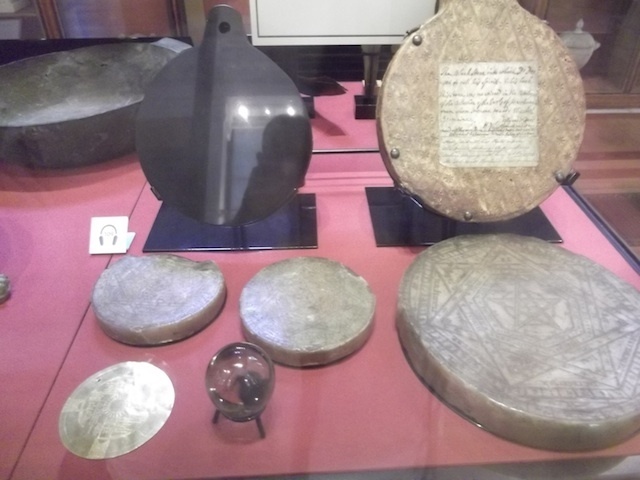 The large disc on the right, the one with the pointy star thing (someone correct us if we're using the wrong terminology) is known as the 'Seal of God'. Dee apparently used it to support his crystal ball while 'scrying'. The smaller wax discs were used to support his scrying table. You'll also note the gold amulet, to the left of the crystal. This is inscribed with the visions of Edward Kelley, one of Dee's otherworldly peers. Finally, check out the black reflective fellow at the back-left. 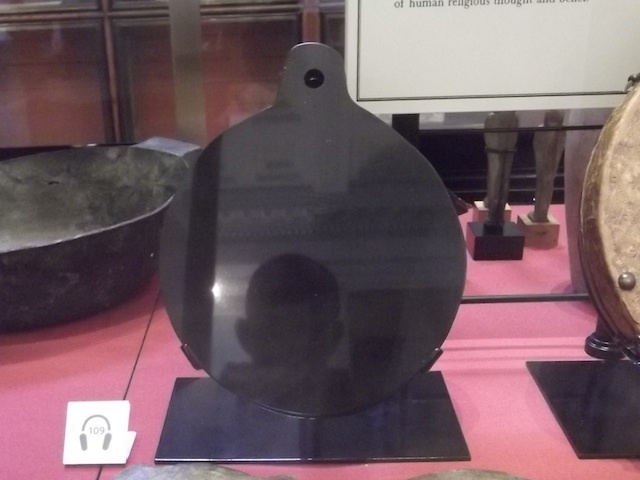 This is an old Aztec relic, made of obsidian and shaped into a hand mirror. Dee used it to conjure up demons. We decided to give it a try. That shadowy figure is not some horn-ed daemon from the eighth circle of Hell, but Londonist Editor M@, chanting Treguna Mekoides Trecorum Satis Dee, a spell what he learned off of a film once, which happens to contain the good doctor's name. All we conjured up was a funny look from a passing tourist. So, go, have a look. Dee's going to be very popular soon. Damon Albarn is writing an opera about the mystic. Yes, really. Rather bizarrely, 'Talisman' by Air just came on the radio as we were finishing off this piece. Signs and symbols are everywhere.